Mad Jack's ARS was founded in February 2007 particularly as a contest group although we also like to support special events like JOTA. Our clubhouse is near the village of Dallington in East Sussex in locator JO00EW and we operate from there under the call M0MAD.We are named after John "Mad Jack" Fuller who was a Member of Parliament and Squire of Brightling. John Fuller was a founder member of the Royal Institution. He was a friend, mentor and supporter of Michael Faraday. Among other good deeds he donated money for the first lighthouse at Beachy Head and for Eastbourne Lifeboat. But most of all Mad Jack liked building follys and towers on top of hills. 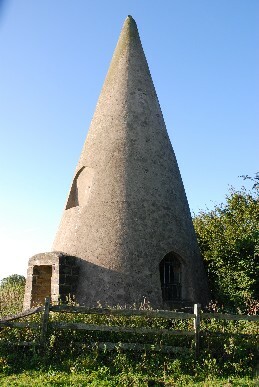 He built the Sugarloaf at Dallington which is next to our club house. QSL cards. The M0MAD QSL manager is Paul G4RRA. We QSL on receipt either via the bureau or direct and have now sent out all outstanding QSL cards. 73 de M0MAD team. Results. M0MAD 2m band winners in the Open Section of the the March 2007 144/432. Our first contest and an excellent result despite the weather. The 100ft trailer tower got stuck in the mud and so we were unable to put up the 2 x 17 ele M2 array and had to run with a single yagi at 50ft. M0MAD First in G in the 2007 & 2008 ARRL International SSB DX Contest Multi One section. We entered the ARRL again in 2008 with bigger antennas and improved our score considerably. Subject to some conditions, Mad Jacks can sometimes loan equipment and antennas for special event stations. We have provided HF gear including the trailer tower, HF yagis, rigs and amplifiers for Hog's Back ARS for JOTA, for GB0SHS, GB2RUN and GB4WINGS. Enquiries about equipment loan should be made to Paul G4DCV. Many thanks to everyone who gave us points in the September 2007 144MHz contest. More pictures here. If you would like more information or are interested in joining Mad Jack's please contact us.